Nice Article. Great read. The environment in my company is exactly like you had discussed above. We just bought copies of AutoCAD Map 2007 for our users. Given that AutoCAD Map 2007 can now do many of the ArcGIS functionalities, how do you ArcGIS being used? 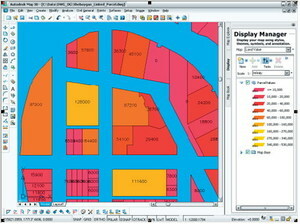 In your opinion can AutoCAD Map 2007 replace ArcGIS? 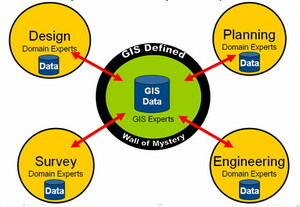 Is ArcGIS's use limited only to database administartion(ArcSDE). I would appreciate your opinions on the matter. I really like the phrase "wall of mystery". Years ago computer analysts were dark priests, mumbling incantations to keep the system running. GIS professionals are the current day equivalent. Now that GIS has gone mainstream IT, it's even harder to find people that understand both worlds. Vish, I really respect where Map 3D has come with the latest release, but it still doesn't hold a candle to ArcGIS. It's missing some basic items such as a metadata system, advanced cartography, strong analytical modelling capabilities, and raster analysis. There is still a need for a fully-featured desktop GIS package (ArcGIS, MapInfo, etc) in most organisations. I appreciate the feedback, these are very good questions. 1) A very important thing that has happened in 2005/2006 is that geospatial has now joined the IT club, and is no longer an isolated niche off by itself. What this means practically is that for people in organizations that have been using AutoCAD for design or who prefer Autodesk Map3D as a create/edit tool, there is now another option to going out an buying a traditional GIS product like ArcGIS. Autodesk Map3D provides excellent create and maintenance capabilities for geospatial data stored in different data stores including ArcSDE. In addition for organizations responsible for maintaining network infrastructure, there are very important operational benefits from an integrated CAD/GIS solution. For example, I have discussed the as-built problem in earlier blogs. 2) Another important thing that has happened in 2005/2006 is that customers are no longer locked into a single geospatial vendor (vendor lock-in). What has happened is analogous to the old mainframe days, when if you bought IBM h/w, then you were locked into IBM applications. One of the main reasons for this change in the geospatial arena are standards like SQL and SQL/MM and the fact that Oracle, IBM, PostGIS/PostgreSQL, and other RDBMS vendors now support spatial data types. First of all this means that you don't really need a "GIS datastore" like ArcSDE to store and manage geospatial data because RDBMS's from Oracle, IBM, open source,and I expect in the future MS SQLServer can do this. But it also means that customers can buy best of breed applications and share data between different vendor's applications in a common spatially-enabled datastore. For example, many people like MapInfo's anaytical capabiliites or the capabilities of other geospatial applications, as Jason has made clear. 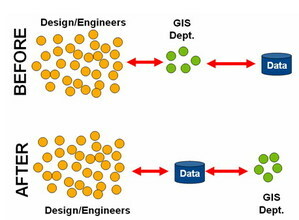 The important thing that has happened is that now there is no barrier preventing the design and records groups from using Autodesk Map3D for design and geospatial data creation and maintenance, the planning group using the same information with MapInfo, and the environment group using Geomedia, all sharing data in a commn datastore. This is important and real. As I mentioned previously at GITA this year two municipalities, Tacoma and San Jose, described how they had done this.